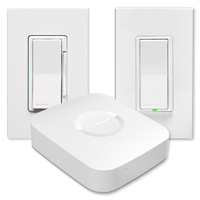 Home security has changed for the better with the integration of home automation systems. There is so much you can do nowadays besides just having a video surveillance system installed in your home. With so many home automation controllers and hundreds of different smart devices available at your disposal, you can literally set up your smart home in many creative ways to work against unwanted intruders. Combining your home security system with other home automation devices allows you to create unique scenes to occur when certain security sensors are triggered. Plus, many home automation systems can be accessed, controlled, and monitored with a mobile app, which means receiving alerts and notifications over the phone of all the activity that is happening at home so you can react and notify the authorities if needed. 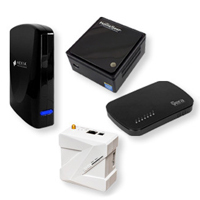 Here are various ways you can use home automation devices to improve security at home. Home lighting can be used in a variety of different ways to scare off and prevent burglars from entering your property. The first layer of security can start with using motion detector lights in the exterior of your property. 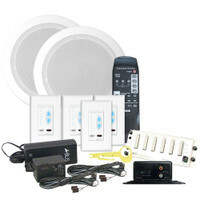 Add them in the dark, shadowy areas where intruders can hide and sneak into your house. Place them on your front porch and in areas that lead into your house such as your driveway, back fence, and around your garage. You can also prevent break-ins by setting up “vacation” or “away” scenes that turn your interior lights on when you’re away from home. This way, your lights will mimic your nightly lighting behaviours so that it appears that someone is home when you’re really away on vacation. Another way to really scare off burglars is to set up a scene that turns on and off all of your home lights repeatedly after sensors detect a break-in. 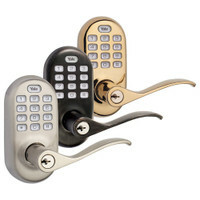 Usually, one may think that a smart door lock is only to be used on the front and back door, but you can actually install them on all of your doors, especially on the interior doors of your home. Even though this may seem excessive, there’s a good reason you might want to consider doing this, especially if there are valuable things in all of your rooms. Home burglars are opportunistic, so if they break into your home through a window and set off your alarm, they might try to quickly steal stuff from your bedrooms before they run off. By having scenes (away or vacation) that include your interior door locks to automatically lock when a sensor detects a break-in, you can prevent this from happening. Besides having your security system set off an audible siren after a break-in, you can also set up a scene to include your home audio system to turn on and play loud music. Although this may annoy your neighbours, it could add that extra bit of security to scare off home burglars and make them think twice before trying to steal from your home or any other home in your neighbourhood again. Most home controllers come with free mobile apps that will send alerts and notifications to homeowners on their smartphones. This means homeowners can receive a variety of different notifications, from live video feeds showing who or what triggered a security sensor to notifications from a smart door lock indicating that one of the kids used an approved code to enter the house. Receiving alerts and notifications on the phone has not only made it possible for homeowners to react quickly, assess the situation, and notify the proper authorities, but also has given them peace of mind knowing that their smart home is equipped with various connected devices that will add extra layers of home security. If you would like to improve your home security by adding extra smart devices to your property, please don’t hesitate to call us on 02380626900 (8.30 a.m. to 4:30 p.m. Monday – Friday) for free support and product advice or email us on enquiries@techhom.com.